not, there is some on occasion. 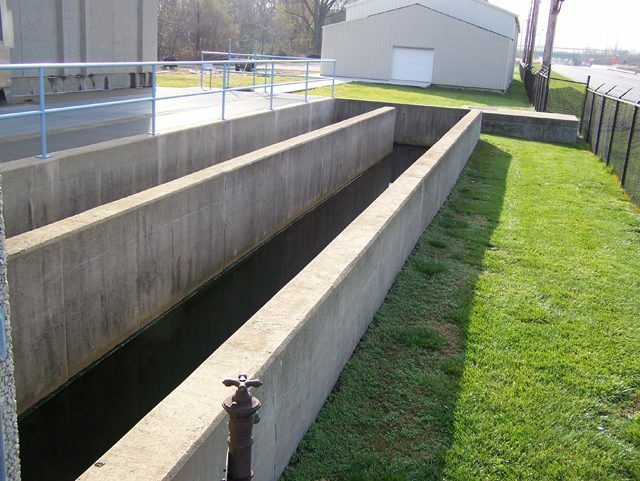 Sewage plants are often out of sight, out of mind, and people usually like it that way. But people who work at the water treatment plant in East Chicago, Indiana, want everyone to know about an ecological come-back story there. I’m game. So I meet the plant director Peter Baranyai. The treated wast water is from nearby homes and factories. And when it leaves the pipe, you’d swear it’s a natural stream. Apparently, it’s fooled plenty of critters, including Chinook salmon. 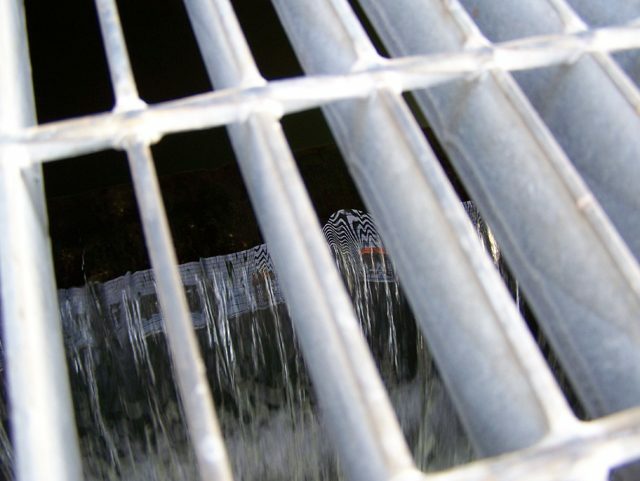 Each Fall, salmon swim from Lake Michigan, past shipping canals, steel mills and chemical factories – just to spawn in the treated waste water. The salmon spawned earlier than normal this year, so, I only find dead salmon on the banks. The government introduced Chinook salmon to Lake Michigan decades ago, but for a long time, salmon wouldn’t spawn here, and birds and nearly everything else shied away, too. Baranyai says one problem was that they used to disinfect water with chlorine. Baranyai says in the late 80s, things turned around. His plant added better filters, and now, when they disinfect water, they kill bacteria with ultraviolet light, not chlorine. In just a few years, salmon started spawning – right in the plant. Plus, fresh-water sponges grow in the plant, and herons showed up. Word got around. 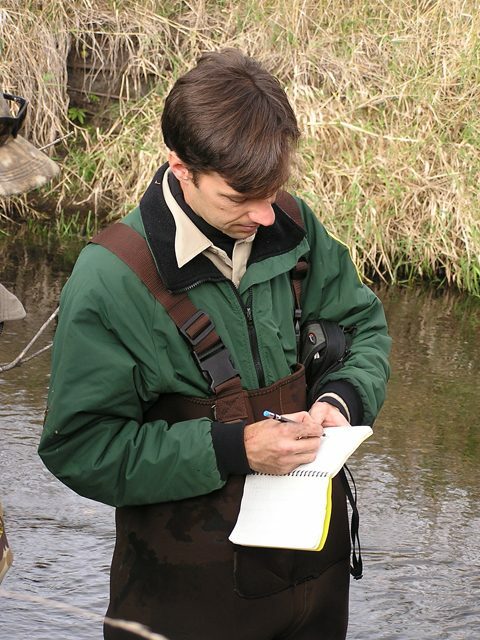 Roger Klocek was a biologist at Chicago’s Shedd Aquarium at the time. He learned the news from a fellow scientist. Klocek says you have to understand, for a long time people ignored water treatment plants or they expected them to remove only the worst industrial pollutants. Klocek says, too often, people assume industrial areas like East Chicago will always be ecological basket cases. He says, sure there’s room for improvement, but having one concrete example of something that works? That can give you hope about what nature can do if you give it a chance. For The Environment Report, I’m Shawn Allee. I wanted to begin my tour with interviews at Dow’s chemical plant in Midland. That’s where dioxin and related compounds were created: the dioxins were by-products of chemical manufacturing. After a month of calls and emails to Dow, a spokeswoman said the company was interested in talking about the future – not the past. But the past is the reason there’s a problem now. So, I start my tour a bit downstream. Michelle Hurd Riddick picks me up near the plant. She’s with The Lone Tree Council, a Michigan environmental group. We follow the Tittabawassee River and the path dioxins took over time. 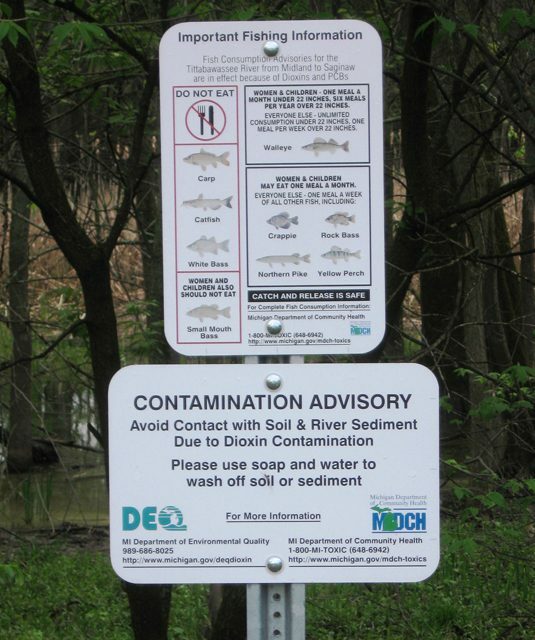 Hurd Riddick says fishing is a huge past time in Michigan – but dioxin’s made it complicated. Actually, the signs tell you which fish to avoid, and how much to eat, or not. The US Environmental Protection agency worries dioxin causes cancer and diseases that affect immune, reproductive, and developmental systems. Fish advisories cropped up in 1978. That’s after Dow warned Michigan and the federal government about dioxin in the Tittabawassee River. While the plant’s dioxin pollution is well below federal limits, the old dioxins are still around, and they’re not just in the river. Flood waters leave behind contaminated silt. 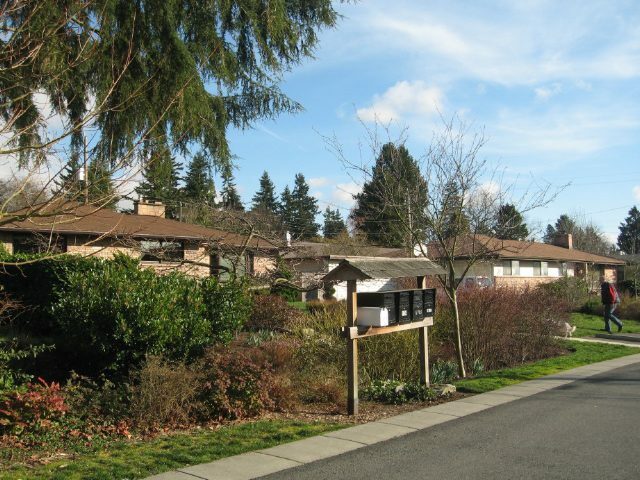 Dioxin’s been found in the soil of yards and in parks like this. One worry is that kids would get exposed by getting dirt in their mouths. Other parks and some yards had soil scraped and removed. 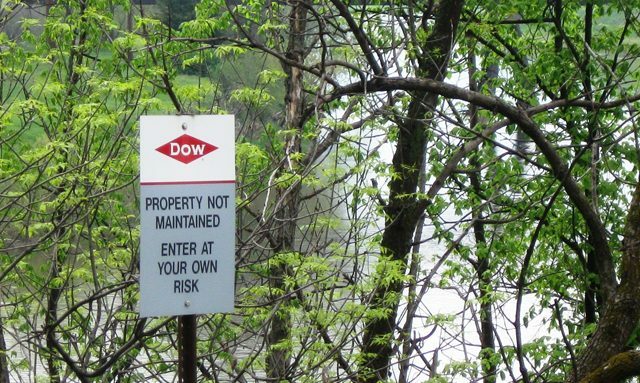 Dow cleaned up several dioxin hot-spots in recent years. Michigan and the US EPA want more of a top-to-bottom effort. That might include a sweep of fifty miles of river and part of the Great Lakes. Riddick’s middle-aged now. The dioxin was in rivers and Lake Huron before she was born. No one knew that far back. But residents did learn about the problem thirty years ago. Today Dow, the US EPA and Michigan are still debating a final solution. Hurd Riddick says the whole country should care about how this plays out. A final dioxin-clean up could take more than ten years. Michelle Hurd Riddick says she can wait that long – if it’s done right. But she says it wouldn’t hurt if the clean-up got started now. pests in the water to invade both systems. Jennifer Nalbone: They are just incredible eaters, and they get as big as 3 to 4 feet, 80 to100 pounds when mature. And they are just prolific. Some species, the females can produce over 1 million eggs in their lifetime. So the fear is, like they’ve done in the Mississippi River Basin, they’ll get so big, they’ll have no predators, they’ll eat so much food, and there’ll be so many that they’ll basically take over the ecosystem. 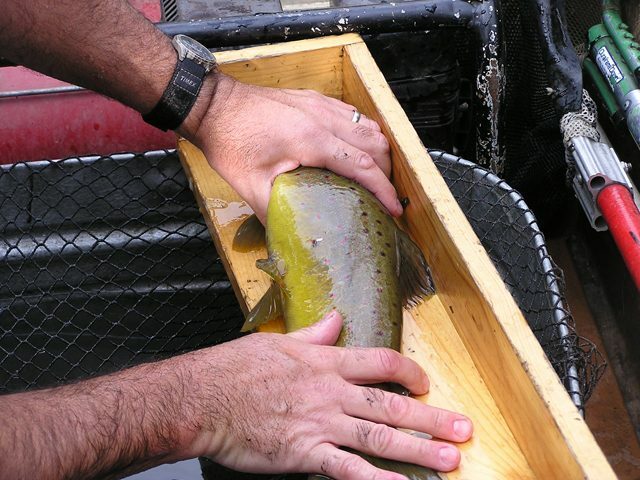 In some areas, where they’ve invaded, upwards of 90% of the river’s biomass is carp. Lester Graham: You’ve probably seen this fish on videos or something like that – they’re the ones that as a boat passes by, they’ll jump out of the river, and sometimes even hit the boaters. Nalbone: I admit, the first time I saw a video of the jumping silver carp, I was so startled I laughed at it. But there’s nothing funny about 50, 60, 70 pounds of fish flying at you when you’re going 20 miles an hour. It could kill someone. Graham: Now, there’s this electric barrier in place that actually shocks the water so the fish is discouraged from coming into the area. But now there’s concern that the fish has invaded a nearby river, the Des Planes River, that’s very close to this canal. So, why’s that a problem? Nalbone: Our concern is with flooding. Just last year, we saw major floodwaters in the Des Planes River, where floodwaters connected the Des Planes and the Chicago Sanitary Ship Canal in streams of water several feet deep. And carp could be carried into the Chicago Sanitary Ship Canal in those floodwaters. Graham: So, what are you proposing? How could we stop the fish from going any further? Nalbone: Well, the long-term solution is hydrologic separation of the Mississippi River Basin and the Great Lakes Basin. Army Corps of Engineers has been authorized to study that problem, but that’s a multi-year project. Right now, what we’re concerned about are floodwaters this fall. We are pressing that the Army Corps of Engineers put in place sandbags or berms in the low points between the Des Planes and the Canal. And also fill in some of the culverts in the IMN Canal that connect to the Chicago Sanitary Ship Canal. 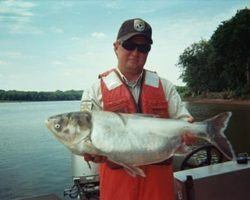 Graham: Now, I’ve watched this situation for years – long before the Asian Carp invaded the Mississippi River system – and I’m wondering, even if further millions of dollars are spent, to try to put up barricades or stop this fish, whether it’s simply inevitable that this fish will get into the Great Lakes. Nalbone: Well, this is a battle against time right now. If we can block the future floodwaters from the Des Planes – which is probably our biggest hole in our defense right now – and plug the culverts in the IMN, we can buy ourselves some good time. But we won’t be out of the woods until we separate the Mississippi and the Great Lakes Basin. But we can’t let this invasion happen. It would be, perhaps, the greatest anticipated ecological tragedy of our time. So, I don’t think that inevitable is an option. We have to get it done. Graham: Jennifer Nalbone is with the group Great Lakes United. Thanks, Jennifer. When you eat cheese, you might not realize that something so delicious creates a lot of waste. And that waste – that pollution – ends up going into the drain. It eventually ends up in rivers and lakes. We’re at a cheese factory in Holmes County, Ohio where they make nearly 60,000 pounds of cheese a day. The big stainless steel vats look immaculate. But our shoes are wet. Bob Ramseyer is CEO of the Alpine Cheese Company. He says the floors are covered with water because the equipment is constantly being washed. The cheese factory’s wastewater includes not only those caustic chemical cleaners, but wasted milk by-products. One milk nutrient is the chemical, phosphorous. 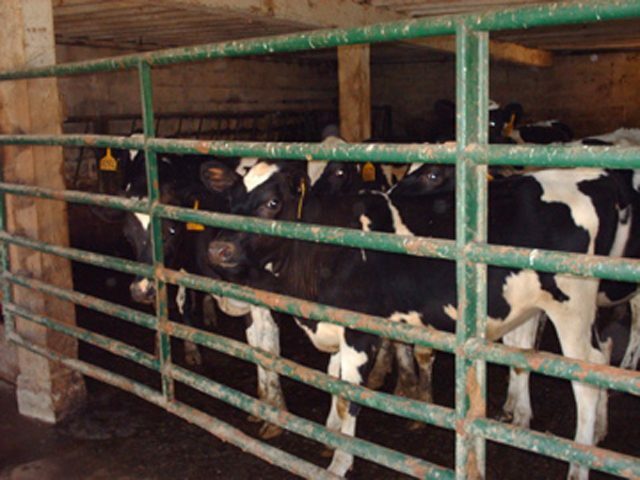 About a decade ago, the Environmental Protection Agency told Ramseyer that the cheese company had to reduce the phosphorous it was releasing into the nearby river. Ramseyer was concerned. Alpine Cheese was among the first to negotiate what’s called a nutrient – or water quality – trading program. Instead of reducing the phosphorous coming from his factory, he pays farmers to reduce manure – another source of phosphorous – from washing from feedlots into the river. Mervin Hershberger is an Amish dairy farmer with 125 acres and 54 milking cows. His farm looks like a postcard – beautiful hilly green pasture. But a lot of the manure was washing off his farm into the streams. Herberberger says the cows were grazing right around the water. Hershberger didn’t like it, but he didn’t have money to change it. So when the County Soil and Water Conservation District held a neighborhood meeting to explain that Alpine Cheese was going to pay to reduce pollution from nearby farms, Hershberger saw a way to afford to clean up his farm. He did about a dozen projects to reduce manure run-off into the water, like building a fence to keep the cows out of the stream. Hershberger gets paid for the amount of phosphorous he keeps out of the water. About 25 other farms in Holmes County are doing similar projects to reduce water pollution. And Alpine Cheese foots the bill. In exchange, the company doesn’t have to clean up wastewater coming from the cheese factory. It’s a lot like a cap and trade program on water pollution. There are a growing number of small programs like this around the country. But some people are trying to create water trading projects on a much larger scale. That would mean a factory in one state might be able to pay farmer in another state. Eventually, all of the thousands of factories in just one river basin could pay farmers enough to reduce dead zones like the one in the Gulf of Mexico and in some of the Great Lakes. For The Environment Report, I’m Julie Grant. Gary Anderson takes me out on his back porch and all you can see is Coal River Mountain. Even on a cold, gray winter day, it’s beautiful. When he retired, Gary and his wife Barbara moved from Connecticut back to her family home in Colcord, West Virginia. 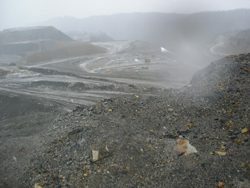 Other mountains in the area– Cherry Pond Mountinan and Kayford Mountain have been flattened so energy companies could get to the coal inside them. Over one million acres in West Virginia, Virginia, and Kentucky have already been leveled to mine the thin vein of coal. The mining companies dynamite the tops off to get to the coal underneath. Mountains are shorted and flattened–- often by 100’s of feet to get to a 14-inch seam of coal. What the dynamite loosens is dumped in the valleys. Thousands of miles of streams have been covered over and nature destroyed. It’s pretty simple. They put dynamite in the mountain and blow it up. Joe Lovett is the Executive Director of the Appalachian Center on the Economy and the Environment. He’s been fighting mountaintop removal for the past 10 years. It’s like a layer cake. The mountain is like a layer cake and that coal is the icing. The dirt and rock in between is the cake. There is a lot more dirt and rock and mining waste than there is coal. And when they blow up the mountain the dirt and rock swell. So they have even a bigger problem because they have more material than they know what to do with. So, as they blow the mountain up they need to find something to do with the dirt and rock and they dump it into the streams and the valleys. Dumping into streams was stopped. The Surface Mining Act’s Stream Buffer rule protected the streams. But the new Bush administration rule changes that. Joe Lovett says that Coal River Mountain fair game for Massey Energy to blow the top off and fill the valleys. Lovett says its not good for the environment and it’s not good for the local economy. The mining industry argues that we need this inexpensive energy source in order to be energy independent. But, says Lovett and other environmentalists, if valley fills were outlawed tomorrow the cost of coal for our electric rates would only go up by pennies. I’ll also talk to an official of the mining industry about why this type of mining needs to continue. The fact it provides American energy and jobs and that West Virginia’s economy depends upon it. Back at Gary Anderson’s home, he wonders how it came to this. But, the mining companies now have the legal right to level the top of Coal River Mountain and fill up the valleys and streams above Anderson’s home. For The Environment Report, I’m Sandra Sleight-Brennan. the side to count and measure them. kinds of animals, including people. quality, and not all of them were happy with the idea. 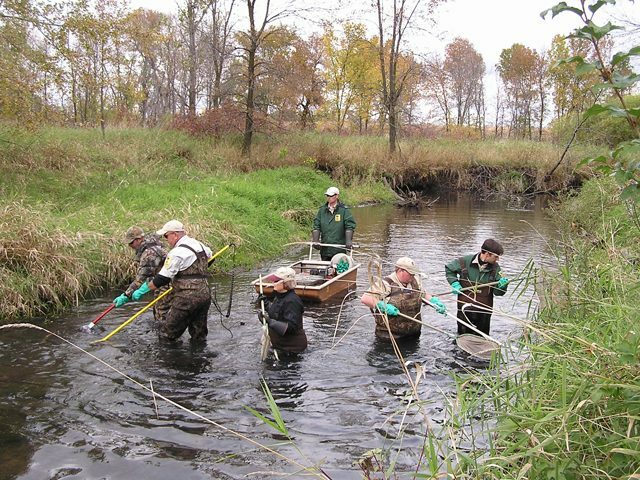 protect the stream, as much as 150-feet wide. is too warm for the trout. instead. 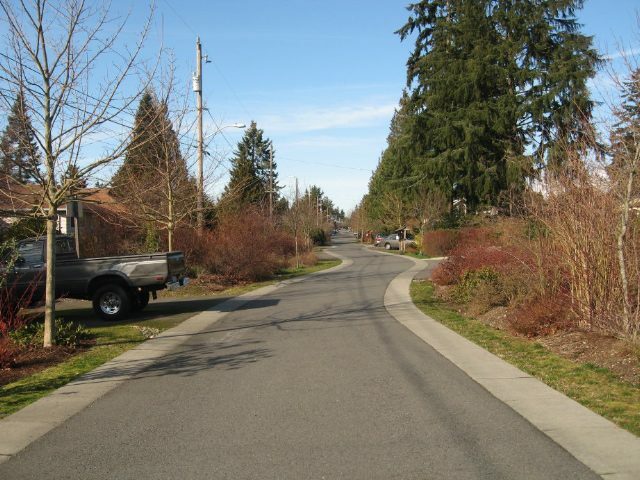 They can build narrower streets and shorter driveways. runoff long enough that it can soak in. hiding places and spawning grounds for the trout. For The Environment Report, I’m Stephanie Hemphill. as imperiled today than just 20 years ago. 61 types of fish have gone extinct. Howard Jelks is the lead author of the study. off parking lots and streets. drain and what chemicals we’re putting on lawns, and on farms. rainstorms and ends up in local creeks and rivers. 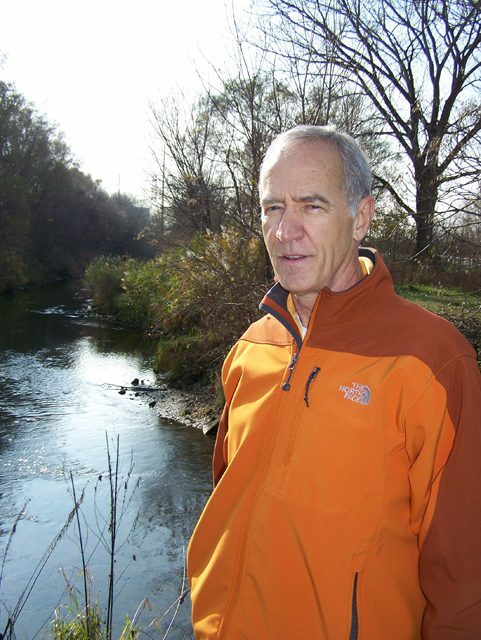 Russ Gibson is with Ohio Environmental Protection Agency. He says that dirt kills aquatic bugs and fish. up where fish lay their eggs. can make flooding more of a problem. So, how much dirt are we talking about? to storm water runoff from construction sites. 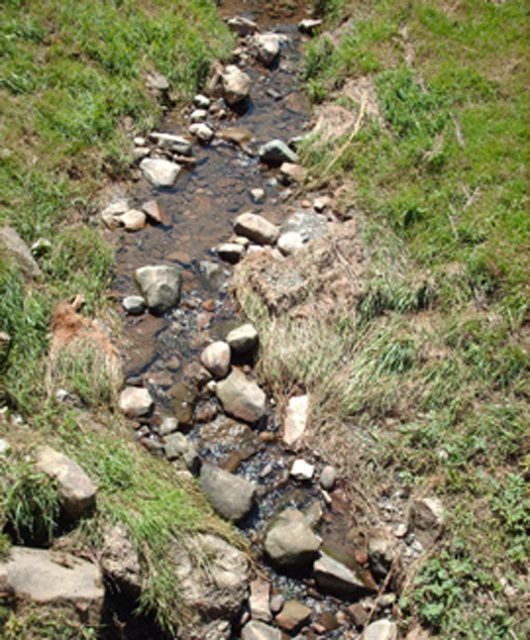 soil can wind up in local streams. builders get away with it. Lance Schmidt is a builder. But he’s not your typical builder. he’s seen as a trend setter. doesn’t really think it’s the problem. regulations such as setbacks from streams. streams clean, and help cities with flooding problems. they can build new wetlands somewhere else. 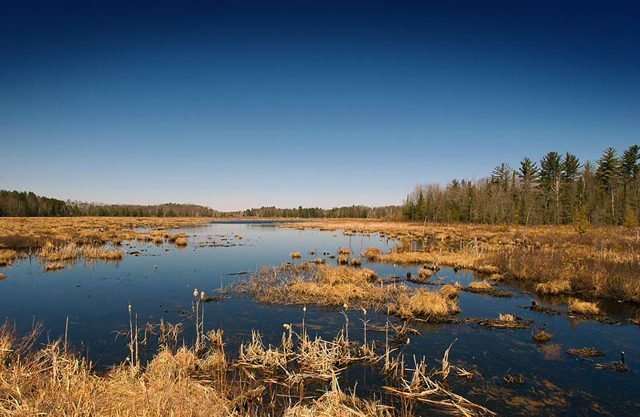 make sure the nation doesn’t lose more of its wetlands. the National Wildlife Federation. He doesn’t like the rule. new stream if they have to destroy one. evidence that a stream can ever be replaced. For The Environment Report, I’m Tracy Samilton. 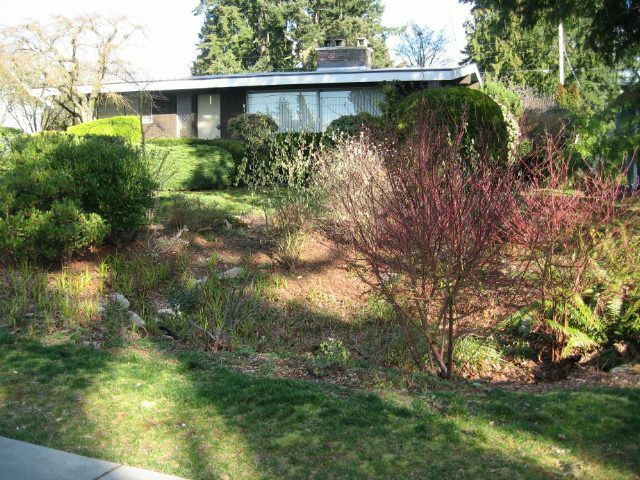 ditches full of native plants that filter stormwater. in the country. But we’re actually admiring a big-city sewer system. driveways get two parking spaces between the swales. walks by the bioswale she says to her it just looks messy. contaminants into a nearby creek. are looking for ways to deal with toxic runoff like that. and fertilizers are trapped in the soil, and some of them are broken down in these bioswales. enters the creek. But he says the runoff has been slowed to a trickle. 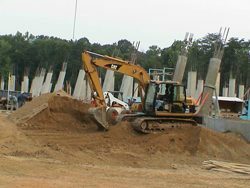 able to lower the cost to about the same as conventional stormwater treatment. planning to filter the runoff through bioswales before it pollutes the lake. streets where the most runoff enters waterways. For the Environment Report, I’m Ann Dornfeld.